Restaurants require excellent food and excellent service to succeed. Providing excellent service means having well-trained employees and an efficient system to run the store. With iPad point of sale systems designed for restaurants, providing excellent service is easy. The simple user interface streamlines training employees. As they perform their duties, all activity and sales are logged into either a local or cloud-based storage. 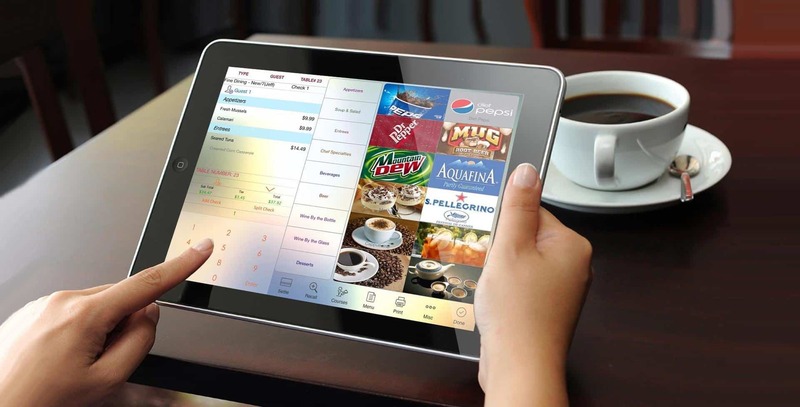 An iPad POS system for restaurants keeps all store data available for review at any time. That also simplifies accounting, keeping books reconciled. Because all those features take time to research, we’ve decided to make it easy for you. Below we reviewed our top picks based on features, pricing, and support. Read on to find which iPad POS system will maximize your success. When trying to figure out which iPad POS works best for your restaurant, you’ll want to consider which system has the most features aimed at making a restaurant operate more smoothly and efficiently. At the same time, you don’t want to shell out a large amount of money on something so necessary for the business. TouchBistro is aimed at the restaurant, food, and beverage industries, so all of its features are crafted with that in mind. It is a cloud-based iPad POS that employees can access from any device they choose, making it quite versatile in the workplace. Its features allow you to maintain and monitor the daily operations of your restaurant. TouchBistro is designed specifically to work with an iPad. Your whole restaurant will be managed from this device. If, however, you need to expand the number of iPads, you’ll have to use the Pro Server Application on a Mac Mini. Featuring a simple, intuitive design and user-friendly features, TouchBistro is another cost-effective system that is good for both small and large restaurants. As the name implies, this POS system is targeted towards businesses in the food and beverage industries. A strong reputation is also behind TouchBistro. It has climbed to the top of the POS world, successfully getting ranked as the top-grossing POS application on Apple’s App Store in over 35 countries. It’s also received numerous awards and honors for its stellar performance in the industries it services. TouchBistro has the advantage of being locally-installed and does not require Wi-Fi or internet to run, except of course for the initial download and software updates. For a standard subscription, only one iPad is needed, the whole restaurant will be managed directly from this device. For two or more iPads, the Pro Server Application must be run on a Mac Mini. This will act as a central database for your restaurant. All of the iPads will communicate with it to stay in sync with one another. The cloud-based service also offers services for viewing reports and other important restaurant data and analytics. You still must have Internet connections for credit card payment and processing. 24/7 customer service is offered for both Standard and Pro subscribers. They can either be called or emailed in the event of a customer service inquiry. There is some client/staff dialogue going on at the TouchBistro Facebook page as well. Here is where they also provide information about updated features and new TouchBistro developments. If more help is necessary, there are some short YouTube videos that give overviews on various features and functions, ranging from getting the POS system set up to configuring it once it’s running. They also have a Twitter account. The TouchBistro website also provides a comprehensive support section, complete with set-up guides, instructions, and videos. TouchBistro is one of the most cost-effective and affordable restaurant iPad POS systems available on the market. All you need is iPad minis, or if you expand, a Mac Mini, as well as a cash register. That could put your set-up cost at around $1,000 in hardware, as opposed to some traditional non-iPad POS systems that could cost up to $20,000 to set-up. Solo – $69/month for 1 license. Dual – $129/month for 2 licenses. Team – $249/month for up to 5 licenses. Unlimited – $399/month for unlimited licenses. A license is basically one register. All of the plans include their 24/7 customer service, free updates, cloud-based features, and unlimited users on the system (staff who are not licensed). If your business has particular needs/questions, they can give you custom quotes as well. They provide a free trial just in case you want to be sure of what you are doing. There have been some complaints of long customer service wait times, glitches, and lack of features for more complex inventory needs. 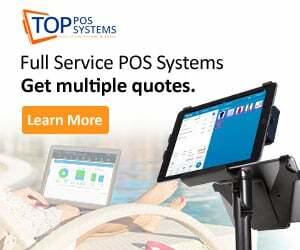 Some people have complained that there is not much functionality to the system outside of restaurants, but that’s what TouchBistro is trying to be – a restaurant POS system. Breadcrumb POS is another iPad POS designed with your restaurant in mind. It was created by industry professionals who have had extensive experience in dealing with all the daily difficulties of managing a restaurant. They were recently acquired by Upserve, but the system is still referred to as Breadcrumb POS. A host of special features comes with this POS, including table management, ordering, customer management, and much more. Breadcrumb is exclusively cloud-based and mobile, it cannot run on traditional desktop computers. You must have an iPad to use it with. You must additionally have a wireless network and broadband internet connection. Breadcrumb does offer an offline mode in the event of internet outages. You can still encrypt credit card data and store it until a connection is restored. This POS doesn’t charge for support plans. There is an extensive catalog of support services available online, such as training videos, a community forum, and a searchable support knowledgebase. You can reach customer support staff by email or phone. However, for more complex issues, a live representative is available through their technical support line. Additionally, when you begin using Breadcrumb, Breadcrumb has a representative walk you through the program. This can be helpful as you set up a POS system for the first time. It can also be helpful so that you learn all of the extra features available to you. Another option is to have a representative actually come into your store and set up with you. As this is an iPad app, most employees will learn quickly. However, the app offers internal training for your employees, giving them the confidence to maneuver this app. Breadcrumb also offers a staff training opportunity. If you don’t feel comfortable training your staff, this is an excellent option. Finally, there are endless how-to videos available to your staff, making it easy to resolve issues on your own. There are several features which help your servers specifically with handling your menu. First, Breadcrumb allows your servers to search for items as they are entering them on a tab. This makes for quick selection of meal items, instead of endless flipping through the menu screen. Additionally, Breadcrumb allows you to view a report which shows which meals are most commonly ordered. This can help you simplify your menu and help you know what to run sales on in order to make the most profit. Accounting: use Shogo, KitchenSync, and RSI. Analytics: use Avero, Venga, Ctuit, Restaurant 365, Peachworks, and Compeat. Inventory: there are several options here. Orca costs $720 dollars for a one-time license. BevSpot will run you between $149 to $349 a month. Quotes are provided. Bevager offers different pricing plans, the standard being $99 per month, the premium $149,99, and the pro being $199.99. BeerSaver is best done via a pricing quote. Aimed at single-location restaurants with small staffs. Centralized menu and employee management. Built for large multi-location restaurants with 50 to 500 locations. Breadcrumb is more expensive than TouchBistro. The Core plan lacks a lot of the features of the more expensive plans. Several customers have complained that there were several system outages and downtimes. ShopKeep is not specifically targeted at restaurants, but it is included here because of the extremely positive reviews, simple and easy to use interface, and its popularity among small-business owners. This makes ShopKeep the right choice for someone who wants to start a smaller restaurant or wants an affordable restaurant iPad POS system when they are just starting out. ShopKeep makes use of a hybrid set-up, which means that the app runs locally from an iPad and syncs data with the cloud when there is an internet connection. When an internet outage occurs, the app will continue to run with all its features except for the integrated credit card transactions. You can work around this by setting up a backup hotspot router or by running the application with a cellular data plan on the iPad. Customer support is a major highlight of ShopKeep. They won an award for outstanding customer service. They also offer unlimited 24/7 support by live chat, email, text, and web inquiry. Though ShopKeep doesn’t offer the option to have a customer service representative walk you through set-up, they do have another option. The app itself completely walks you through every step involved in starting with your POS. You are trained to use ShopKeep without taking the time to be trained. While there is a $30/mo charge for premium care, which is the ability to call them over the phone, ShopKeep representatives will often reach out via phone to contact customers having issues. Another highlight of ShopKeep is its simple and intuitive interface, which makes it super easy to train employees to use it. The visual design of the app is also sleek and modern, with sound effects that make sense. ShopKeep integrates several services. You can add any of these services at any time. This is because ShopKeep prides itself on growing with its user, not forcing its user to grow. MailChimp: this will allow the business owner to easily do some email marketing to reach potential and existing customers. QuickBooks Online: this makes it easier for the business owner to manage their accounting and finances. Costs $15/month for integration. AppCard: provides personalized offers as a sort of loyalty program to customers. BigCommerce: allows the business owner to set-up an online store. Costs $15/month for integration. Gift Cards: You can add on an integration which allows you to design your own gift cards. This is an excellent feature! 2 hours of free setup with a ShopKeep technician. Free pocket iOS app, now available on Android. No contract, cancel anytime, no commitment required. ShopKeep is not geared at restaurants specifically. Its main target audience is small business owners. This means it will lack some features necessary for larger restaurants, but can still be a good option for people who own or want to open a small restaurant. 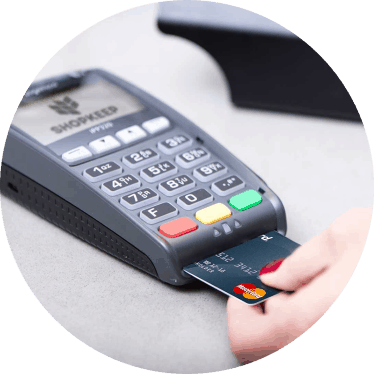 If you want to expand your business, however, you will likely need to consider a different POS system. The restaurant industry is one that is continuously changing. Restaurant owners should always be on the lookout for new ways to improve their business. One of the more recent innovations to this industry has been the introduction of iPad POS systems. 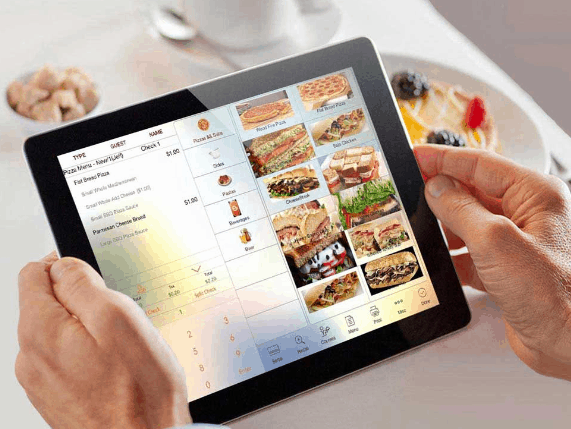 iPad add convenience in the restaurant industry. The right solution can help business excel. Any restaurant’s menu should be continually changing and improving. With a solid iPad POS system in place, this process becomes effortless. Changing the menu is as simple as hitting a few buttons on one device and waiting for the other devices to sync. Updating the menu does not have to be a time-consuming task. This new system of ordering, sometimes right from your table, streamlines the ordering process. Many establishments have begun placing these iPad-like ordering stations right on the table. This puts the control directly in the hands of the customer, ensuring that no server is at fault over a wrong order. Keeping track of your restaurant supply is not always easy. Thankfully, this task has become much more manageable with the addition of the iPad POS systems. With this technology, you’ll be able to see what you’re running low on, right from the point of sale system. You will get a notification from your POS, knowing it is time to restock. All of this is done with just two clicks. You have the ability to create purchase orders quickly, so you can be fully restocked for the upcoming week. Another handy feature is the ability to see a food cost analysis. This feature will inform you about how much it costs to prepare each item on the menu. Based on this, you can set your menu prices accordingly to allow for the best profit margin. Working with the cloud has become a must for any business, and the restaurant industry is no exception. Using the cloud to store valuable data is something that TouchBistro excels in. By using TouchBistro, all of your devices will be synced together regardless of WiFi. From there you will be able to see all transactions that have occurred. Take notice of what sells and what’s not so popular. Check peak times at the restaurant with your POS system, so you can be prepared for the day. At last, keep your books in order with the accounting feature. 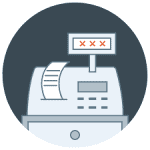 Keeping track of reservations is an incredibly easy task, especially if your POS system has an easy-to-use interface. It is now possible to make reservations for months down the line with the touch of a button. Gone are the old paper calendars with messy eraser marks and scribbles. This tool will allow you to manage the schedule in your food establishment, easily and efficiently. Such an interface will allow you to accommodate various reservations plans efficiently. Also, you’ll be able to manage waitlists in an orderly fashion, without having to worry about skipping a name. What does someone go to a restaurant for? Food. Thanks to reliable POS systems, you can be sure to get restaurant patrons what they ordered promptly. With such software, you can ensure outstanding communication between your front of house and back of house. The second your waiter is done taking an order, the chef already has the ticket in their hand. This type of seamless communication will ensure shorter wait times for customers. Shorter wait times will lead to more customers being served, and of course a better bottom line for your business. If you are a restaurant owner and want to succeed in the food business, an iPad POS solution is a must. It will help your establishment look more professional, while providing superb experience for your patrons. A solid iPad restaurant POS system should do everything it can to help you manage your food establishment. Based on the reviews above, we believe the most comprehensive option for restaurant owners is TouchBistro. It is less expensive than Breadcrumb, but comes loaded with various restaurant features that Shopkeep doesn’t possess. It’s starting plan is priced similarly to ShopKeep’s, so even new restaurant owners will find it to be quite affordable (for the services provided). Shopkeep can still be a good option, if you can consult with their team on how to customize the system for your business. Since Shopkeep doesn’t hold you to a yearly commitment, you can cancel anytime if you feel ready to move on to a more feature-heavy POS system like TouchBistro.